The terms “minimum effective dose” and “law of diminishing returns” seem to be plucked directly from language relegated to textbooks alone. But how can either of these convoluted concepts be at all related to a corseted lifestyle? Let’s not forget that wearing a corset as a matter of daily life means that we must pull knowledge from every branch of scientific research. It is, after all, a form of body modification that effects the entire torso. In this case, we can evaluate just how effective our efforts at waist training are with the guidance of both a medical and an economic principal. As we proceed with this discussion, though, please keep in mind that my approach is entirely related to corset use and waist training as a non-medically-required method of shaping the waist. Some individuals make use of corsets for physiological reasons which may require around-the-clock or otherwise strictly-monitored use of corsets - these folks should manage their corset usage as is appropriate for them. This can be temporary, such as for a special event where a nipped-in waist is a desirable silhouette. Or it can be a long-term goal, as in “waist training” or “corset training”, where the intention is to mold the uncorseted body into a specific shape or to incrementally increase one’s capacity to cinch down in a corset. The corset’s pressure can provide a desirable and comforting physical sensation to those who choose to wear one, be that due to the warmth it provides, the pressure itself, or a minimization of other physical discomforts. There are also those for whom the feeling of wearing a corset satisfies a mental or emotional need, which could be a need for added protection of the midsection, a desire for restriction, or any other non-physical craving. But how much corset time is necessary to meet your goals or get your “fix”? Of course, the answer is different for every individual, and this is where we have to consider what the minimum effective dose (MED) of time spent in a corset is for each of us. The MED terminology comes from the pharmaceutical industry, where it’s necessary to measure how much of a specific chemical compound is needed to elicit a reaction from a patient. The MED in the context of corsetry is just what it sounds like: the minimal amount of effort or time we must put into wearing a corset in order to see or feel the desired results. This timespan will change from person to person, day to day, and corset to corset. The shape of the corset, its overall fit, and the reduction at which it is worn all affect what the MED is. For example, a conically-shaped corset will produce floating rib movement with less time (“dosage”) than what a more cupped-rib corset will. Consider als, the fact that the MED of time for creating a “persistent” uncorseted inch loss will be less when one wears a higher-reduction corset versus a lower-reduction corset (i.e. a 7 inch reduction versus a 3 inch reduction). There’s also anecdotal evidence to suggest that for some individuals the waist training realized with 15 hours per day is very nearly as dramatic as that realized with 20 hours per day, meaning that remaining 5 hours serve a lesser purpose than the first 15. From the realm of economics comes the “Law of Diminishing Returns”, which tells us that at some point additional effort will produce less results for the effort. This does not mean that additional effort beyond that point causes a loss of benefits altogether. Understanding that those extra several hours that you might be currently spending, or contemplating spending, in your corset aren’t necessarily as productive (in terms of waist training achieved or overall pleasure derived) as the first is an important, though difficult, distinction to make. These concepts and theories may be interesting (or terribly dry, depending on your perspective), and maybe even applicable to your own corset journey. But how can you make use of them? The answer lies in self-observation and being willing to take notes on your experiences. For the sake of illustration, I've recorded my own comfort levels (ranging from 0% - extremely uncomfortable, to 100% - perfectly comfortable) in wearing a specific corset at a specific reduction over the course of 23 hours and plotted it, as you can see here. 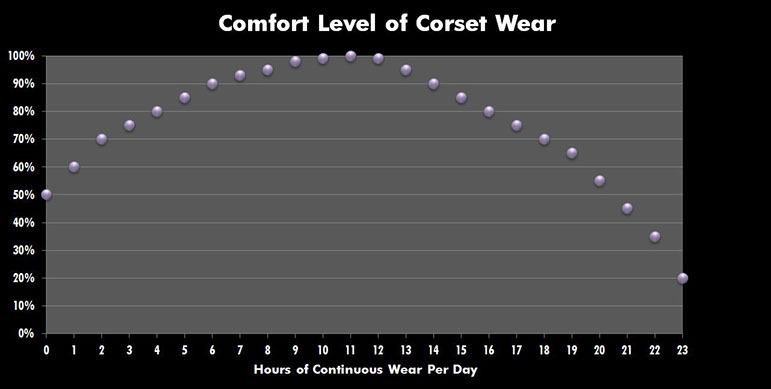 You can see that my level of comfort (this can also be interpreted as the "level of benefits gained") goes up for the first 10-11 hours, where I am able to derive the most enjoyment from my corset. Less hours produces a smaller amount of pleasure, and more hours causes an eventual decline in it. This decline is due, in part, to my personal lifestyle demanding that certain activities be done out of a corset, along with the fact that my anatomy begins to reject the pressure after so long. I've identified where my comfort level exceeds 90% (between hours 6 and 15), which is my "Sweet Cinch" Range. This is the general time-frame when I can expect to experience the most enjoyment and the most benefits from my corset. Another way to think about this level of comfort is that I essentially forget that I'm wearing a corset during these hours. Any less and I've not yet met my own MED, and any more provides a diminishing return. Even more important to note is the point at which my wearing a corset is less comfortable and/or beneficial than not wearing one at all. With the way that I've plotted out my levels of enjoyment from wearing this corset, you can see that this unfortunate line is crossed between hours 20 and 21. So what does this mean? Likely that I - and the corset - would be "Better Off" without being laced at that point. The return for me is so diminished that it is likely not worth spending more time in a corset. However, this only illustrates my individual case, in my individual corset(s) and reduction. Now, lace up your corset of choice, take note of your reduction, and keep it on for as many hours (up to 23 for this test) as you can manage without harming yourself or making yourself ill. Note that, if you have never worn your selected corset at your selected reduction for more than a certain number of hours before, do not try to exceed your known maximum for this test. For example, if you have worn your standard-sized underbust for only 10 hours at a 3" reduction up to this point, do not attempt to lace tighter or longer for the sake of this observation! Staying within your known boundaries of corset tolerance cannot be stressed enough. The test can still be conducted for a shorter time frame (you can even break it down into half-hour increments if you'd like). As time passes, record your level of comfort (from 0 - 100%, low to high respectively) on this sheet you've set up at the top of each hour. This is a subjective test, so you should not worry about how accurate your perception of comfort is. You are the only one who needs to know what 80% comfort feels like to you! If you are very determined to get precise results, you may conduct this self-observation on a few non-consecutive days and average the numbers. Now that you have your "Hour" vs. "Comfort %" table, it's time to make a little graph! Another sheet of paper can be gridded out with percentages 0-100% on the left/vertical axis, and hours 0-23 (of whatever your maximum timespan is) on the lower/horizontal axis. Begin plotting out your comfort level over the hours by placing dots at each hour based on the comfort % you recorded. As an example, mine looked like this. From here, we can identify the "Sweet Cinch" Range as the hours you spent in your corset with the comfort level at 90% or higher. This might just be the best time-frame for you to aim for if you'd like to wear your corset daily. If this range is too small for your satisfaction, you may consider your range to be any time-frame spent at 80% comfort or above. The "Better Off" Point, then, is identified by where the comfort % dips down below that observed before the corset was even put on. That discomfort is a sign that your body is ready to be uncorseted, a message which is always best heeded. But because this tool is meant to help you, as an individual, you have the ability to customize and/or interpret it as you please. What you are able to identify about yourself as a corset wearer or waist trainer from this exercise can vary dramatically from person to person. While one individual may use their personal graph as a way to determine when they should aim to take their corset off for the day, another may use it to track their progress by conducting the experiment occasionally over their waist training journey. However, please remember that this is just that: a tool. Your time spent in a corset cannot be simplified to numbers alone - there are myriad factors which affect how your corset will feel on a day-to-day basis, and the most accurate gauge will always be your own self-awareness.